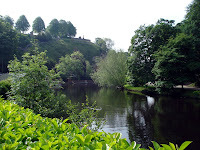 Photo shows the river at Knaresborough close to the railway station and was part of my research for the Knaresborough story. Gardening of course was the main topic of discussion: the best way to get rid of dandelions; how to plant leeks; what were the best shade plants. And so on. It was all very relaxed and Marge mentioned her husband, the solitary riverside walks, even the clutter of all the ceramics. She had even tried out her new digital camera and sent Diana a photo of a miniature fox figurine. Actually it had been an unwanted Christmas present but she would have felt guilty throwing it out. Now, after two years, she had dared to invite Diana Peters to lunch at her house. Sadly two other web-published short stories, one a young boy's poignant journey away from home, the other a young woman's loss livened up with humour, are no longer available. In 1994 The National Association of Writers in Education teamed up with the National Railway Museum in York where they asked for writing about anything to do with railways, which they named Moving Stories. My two stories were then selected to be among the best 200 on the site. For now they languish on my computer. The story sounds really good. Maybe you can send those railway stories somewhere else?